There are so few ideas of what we can make “for the boys.” My Sweatshirt Tote Tutorial has been very popular so I have been thinking for some time about making a drawstring backpack version for a while. 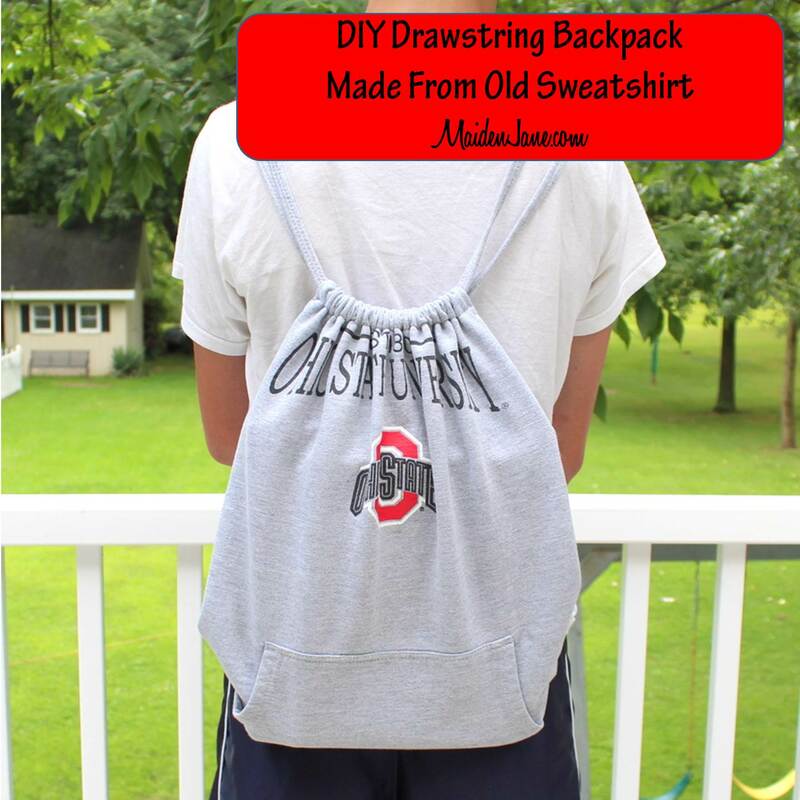 People give me old sweatshirts now, so when my cousin gave me this Ohio State sweatshirt, and learning that my nephew was heading off to THE Ohio Statue University, I knew it was a good time to make this Drawstring Backpack. Too often we have gathered more sweatshirts and T Shirts than we need, so dig into your dresser drawers to see if you have an old sweatshirt laying around. Or visit your local thrift shop on half price day! These make nice gifts for high school graduates. You can always use a drawstring backpack to tote gym clothes, a few books, shoes, or anything else that isn’t too heavy. SUPPLIES: You could make the entire drawstring backpack from the sweatshirt alone. I used a bit of nylon tape that I had on hand. You could also buy 1/2″ twill tape. Or, you can use a bit of sweatshirt to make a loop. A ruler, marking pencil and rotary cutter and/or scissors are all you need. 1. REMOVE SLEEVES: Draw a vertical line as close to the sleeve as possible and cut. Repeat on the other side. Save the sleeves for later use. 2. REMOVE BOTTOM BAND AND HOOD: I try to get as much fabric above the logo as possible. 3. CENTER DESIGN: Now that you have removed all the sides, it is time to center your design. I wanted to make my bag as large as possible. I had about 2″ left of the “O” so I marked the same distance to the right of the “Y” and removed the extra fabric. You will find that the designs and the pockets are not always centered. I try to center the logo. Square off the bottom. I usually aim for at least 18″ in height. You can make your bag longer if you would like. – add a zipper to the pocket. You now have two pieces of sweatshirt with a centered design. 4. CREATE AND ATTACH LOOPS: Cut a 4.5″ length of nylon or twill tape or use some sweatshirt scrap to cut a loop. Fold the loop in half and pin to the front side of the top sweatshirt piece. Pin on the bottom left and bottom right sides, about 3/4″ above the bottom. 5. MARK AND PIN: Place right sides together. Mark 2″ down from the top on each side. This portion will not be stitched so there is room to make a casing. Pin from the right mark, down and around the bag and back up to the other mark. 6. STITCH: Starting at the top right mark, stitch around the bag using a 1/2″ seam allowance. Reinforce the stitching at the bottom corners and over the tape. The nice thing about sewing with knits is that you don’t have to finish the edges. 7. STITCH OPENING: Fold the seam allowances at the top to the wrong side and pin. Stitch down one side, across and back up the other side to keep the seam allowance closed. I used a straight stitch. It helps to lengthen the stitch length when sewing on knits. 8. FOLD AND STITCH CASING: Fold the top of the bag down about 1″ and pin. Stitch along the pinned line all the way around the bag. Turn inside out. I use the sleeves to create the drawstrings. If you have some drawstring material laying around your house, you can use that. Cut the sleeve along the seam. Square of the tops and bottoms of the strips. Lay out the strips until you have the required length of strap. Overlap the strips and sew together using a zig zag stitch. Cut the strips in half along the length of the strap to create two lengths of straps, each 1.25″ wide. Press one third of the strap to the inside. Fold up the other half over the top half and pin. I got tired of pinning, so I started stitching. After that, I put a little bit of tension on the sweatshirt and it rolled into shape. I used a zig zag stitch to sew the straps. 10. THREAD STRAPS: Use a bodkin, safety pin, or any other favorite tool to thread the straps through the casing at the top of the bag. Start on the right side. Thread the strap through and back out the right side. Leave in position. Repeat on the left side. Remember, the strap needs to exit on the same side that it entered. Thread the strap through the bottom loop. Overlap the straps, cut off excess strap, and pin together. Stitch the strap together using a zig zag stitch. Repeat on the other side. I hope you enjoy this tutorial! My original Sweatshirt Tote Tutorial can be found here. I have made many variations of the sweatshirt tote over the years. You can search on “sweatshirt tutorial” on my blog to see more ideas. (I’ve done that here.) Like the idea, but don’t think you can make it? I’ll make you one. Stop by to see all my custom items here. If you make one, please join me on my Facebook Page and share a photo! Each sleeve makes each side of straps? I used both sleeves to cut strips of fabric. I then sewed those strips together to make a long strap. I hope that helps!